To install "DriveHQ FileManager for Windows 8 Store" (The Metro-style App optimized for Windows 8 touch screen computers/tablets), you just need to launch "Store" on your Windows 8 home screen, then search for DriveHQ. 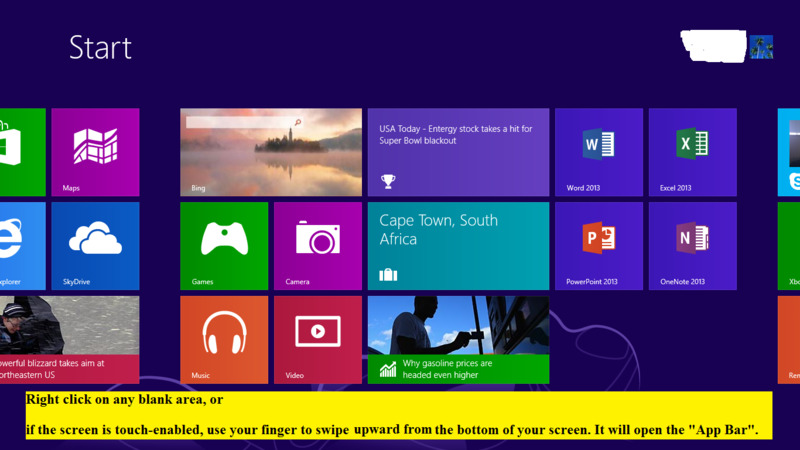 The advantage of "DriveHQ FileManager for Windows 8 Store" is it's optimized for touch screen. 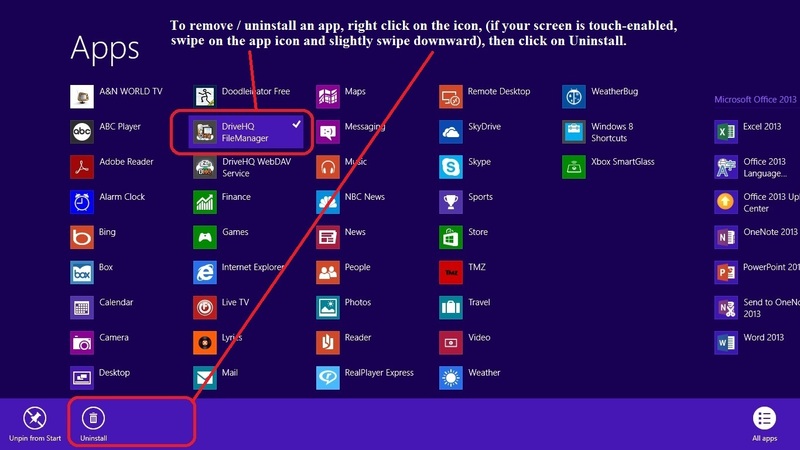 To uninstall "DriveHQ FileManager for Windows 8 Store", it is extremely easy. 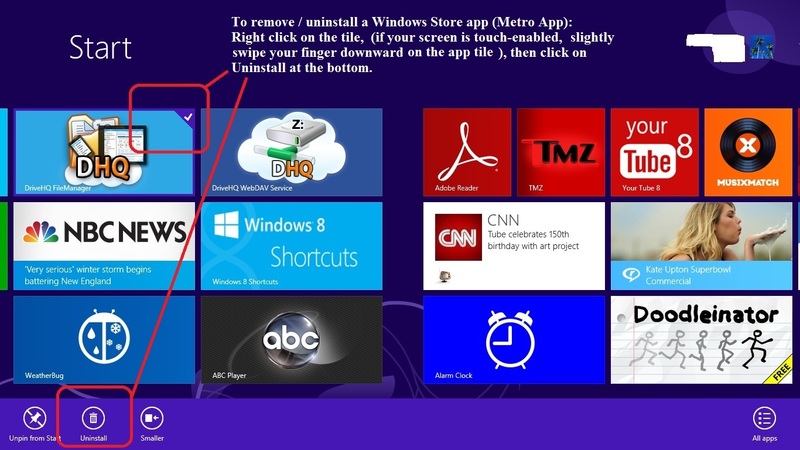 It is surprising why some users had trouble uninstalling an app on Windows 8 Metro interface. Please note DriveHQ's app is a standard app certified by Microsoft Windows 8 Store. The steps to uninstall is identical to any other Windows 8 Store apps. Screenshot 1: How to uninstall DHQ FileManager for Windows 8 Store Metro interface. If you installed DHQ App, but cannot find it from the home screen (maybe you unpinned it), then you can find it from AllApps. Screenshot 3: Uninstall DHQ FileManager for Windows 8 Store from All Apps. FileManager Lite does not create any problems. It is designed to store or backup your files in the Cloud so that you can access your files from anywhere, or share your files with other people (and set different permissions). It cannot open your files directly. To open a file type, you must have the right software installed to open the file type. Again, you just need to find the right software to open your file type. Uninstalling a Windows 8 App that is downloaded from Microsoft's Windows Store cannot be easier. If you don't know what is Windows 8, Windows Store or Metro Style App, you need to contact Microsoft directly, or find somebody who knows better. Sorry we cannot help you. DriveHQ FileManager Lite is a Windows 8 App certified for Microsoft Windows Store. It is just like any other Windows 8 Apps.